The shoulder is one of the most mobile and flexible joints in your body. It is a "ball and socket" joint (glenohumeral joint), in which the ball (the top, rounded part of your humerus) is held in the socket (the shallow, depressed area called your glenoid cavity, located on the outer edge of your scapula). There is a ring of fibrous cartilage (labrum) that surrounds the glenoid cavity and articular cartilage (slick, hard connective tissue) that covers the end of the humerus to help stabilize the ball in the socket and reduce friction. Your entire joint is surrounded by a tough, fibrous, flexible shoulder joint capsule and inner synovial membrane that produces synovial fluid (thick, egg-white like fluid). This helps to lubricate your shoulder joint and allows the bones to move easily within your joint. When your arm is raised over your head the joint capsule is fully stretched, when your arm is lowered to your side, the capsule rests in a small, pouch-like sac. Your bursa is a fluid-filled sac that lies beneath your acromion (bump on top, outer edge of your clavicle) and above your soft tissues to prevent rubbing when your bones are moved. 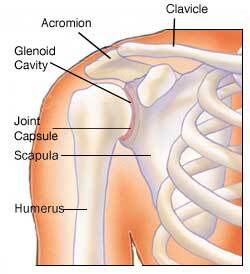 Literally the word adhesive means "scarring", and capsulitis means "inflammation of the capsule". Adhesive capsulitis happens when the shoulder joint capsule and soft tissues surrounding your socket (glenoid cavity) become inflamed, swollen and contracted. This causes bands of scar tissue (adhesions) to develop in your joint; as a result your tissues become less flexible, stick together and restrict movement. You will experience pain, stiffness, a limited range and gradual loss of overall motion in your shoulder joint, because of the adherence of your shoulder capsule to the top of your humerus. 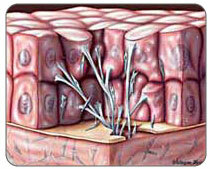 Eventually your joint may become stuck to the point where you have no movement at all. 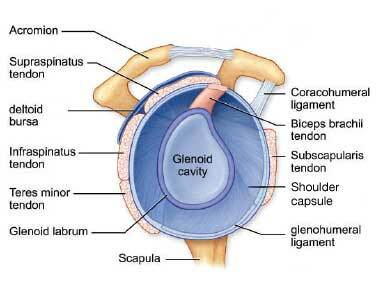 Adhesive capsulitis affects 2 - 5% of the population (about 1 in 50 adults will get this at some time in their life). Generally you will experience adhesive capsulitis in either your left or right shoulder, whichever is your non-dominant shoulder (if you are right handed it would be in your left shoulder and vice versa). About 15% of the population (1 in 5 cases) will get it on both sides at some time in their life, however rarely ever at the same time. It is very uncommon to suffer from adhesive capsulitis in the same shoulder twice and normally it does not affect other joints in your body. Adhesive capsulitis is not known to lead to major damage and/or other more serious conditions; more so, it is generally a side effect of other conditions and/or a condition in and of itself. A Shoulder T•Shellz Wrap® is one of the most helpful tools for a shoulder injury. Using a process we call Blood Circulation Boost Therapy, tissues are safely and gently heated - increasing blood flow within the treated area. Your body's natural response to this increased temperature is to try to maintain a condition of homeostasis - a balanced environment or state of equilibrium throughout the body. To do this, your body responds with a rapid increase in blood flow to the area (this is known as vasodilation), increasing the supply of nutrients to injured cells and flushing out toxins (including lactic acid, commonly found in trigger points) to promote healing. T•Shellz Wraps provide effective, non-invasive, non-addictive pain relief with no side effects.